Ahhh, Painted Canyon. The colorway in Hobby Lobby’s I Love This Yarn! that has taken the fiber loving community by storm. For months I’ve been racking my brain to come up with the perfect pattern for this gorgeous yarn, and this Painted Canyon Hooded Cardigan is it, folks! 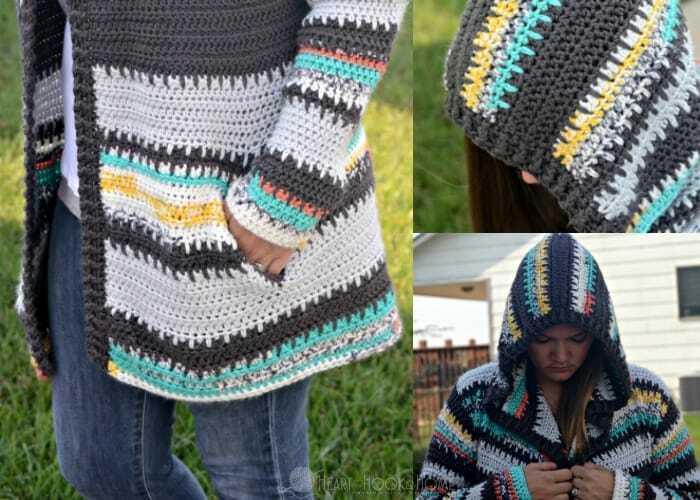 This Hooded Cardigan crochet pattern is probably the favorite of all of my crochet patterns. Or… my favorite, anyway. It is warm. Has a hood. It has a flowy collar. IT. HAS. POCKETS. And don’t forget the gorgeous Painted Canyon colors. Did I mention it has pockets?! 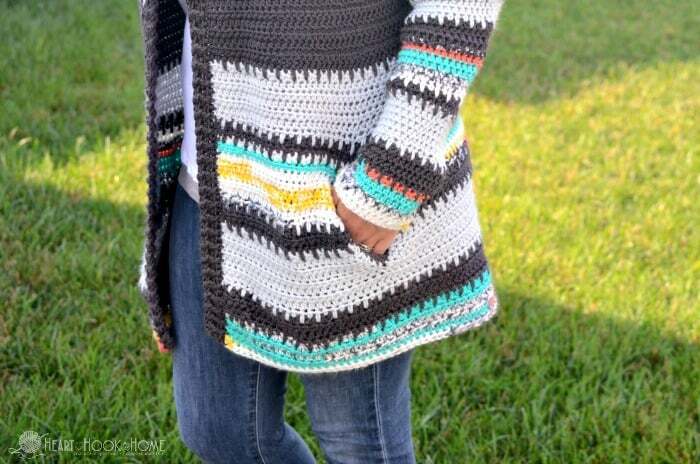 Originally making this cardigan for myself only, I decided to go ahead and write up the pattern so that others that also love the Painted Canyon colorway could crochet and love it as well. Then I thought “why stop with just one size”? So I added six more sizes so that the pattern now includes adult: 0/2, 2/4, 6/8, 10/12, 14/16, 16/18, 18/20, 22/24, and 26/28. For this pattern I used two testers for each size. Testing is important and when it comes to sizes and body types the more the merrier, I say! Speaking of sizes, make sure you measure your gauge before starting! There are two ways to do the pockets: outside and inside. Outside is certainly easier as you can place them wherever you wish without having to alter the pattern. I have also included instructions for making the sleeves cuff to shoulder and shoulder to cuff. This way if you’re controlling the colors it will be easier! Yay! For the adult size 6/8, as pictured, I used three skeins of the Painted Canyon, two skeins of the Graphite, and two skeins of the Light Gray – all I Love This Yarn! Can you believe that the only stitch used is the half double crochet?! Crazy right? If you would like to make a solid color not only will you have a lot less ends to weave in but you will also use a lot less yarn! The spike stitches account for quite a bit more yardage, but then again I don’t think the color changes would be the same without them! Head on over to Ravelry to get your pattern. Thank you for loving this pattern, and for your ongoing support! I’m thrilled to be able to continue creating awesome and easy-to-read crochet patterns at a reasonable price. I want to see yours!!! 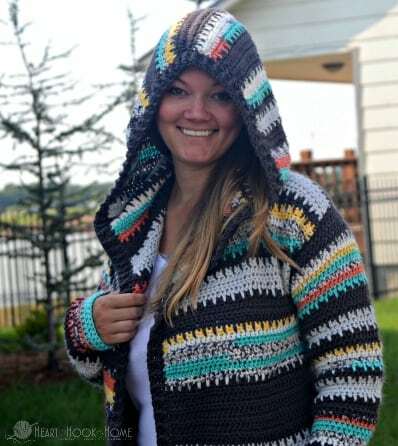 Share photos of your Painted Canyon Hooded Cardigan with me by tagging @HeartHookHome on Instagram and Twitter, and by sharing in the Heart Hook Home Crochet Community group on Facebook! Your links don't all work. Immediately following the children's sizes, you say: "Get the ADULT sizes of this pattern (0 – 28W) here." Unfortunately, "here" just keeps bringing me back to the same page. No adult sizes. I hope going directly to Ravelry will work better. Yes! I was just coming down to ask the same. I really want to make matching ones for my daughters and myself. Please fix the links! Hi Lorraine! 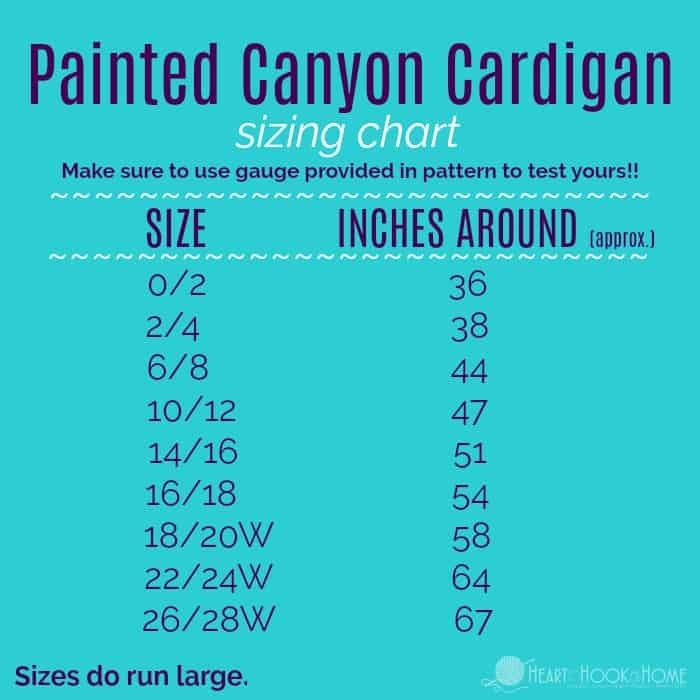 The "Adult" link is formatted to bring you to this informational page for the Painted Canyon Cardigan...if you click the "Ravelry" link, it will take you to the ravelry page where the adult pattern can be purchased. Sorry for any confusion. I'm making the painted canyon cardigan for a family member and she wants the sleeves tighter. How would I do that? I’m making the 0/1 size pattern to my daughter. She would like the hood to come down further over her head. I don’t want to frog. Would it work if I added more rows before the hdc2together in the center? Any other ideas? Hi Sheila! Yes, adding more rows before the center decreases should work. Hi, is the pattern for this still just hdc? like the childrens ones? i want to do a solid colour one but it looks different to the simplicity of the childrens ones and i don't want to buy the pattern to find its not the same. so really my question is, is this just the same as the childrens ones but for adult sizes? Hi Rebecca! Yes, the adult sizes are just bigger...the stitches will still be hdc. Hope this helps! Hi Ashlea, I do love this jacket so much and have some yarn I would like to try and use for it but I only have 800gms...approx 1520 yards. Is this going to be enough for a size 14/16 please? I'm not being funny but I can't really afford to buy pattern just to discover I don't have enough yarn so need to sort that out first. Thanks so much for creating this fabulous jacket - fingers crossed I have enough to make it! Hi Maura...the 14/16 will take approximately 2400 yards. I just started the 1st row of the hood pattern & where it says to HDC2TOG across entire neck area (for smaller hood), does that mean that I do the HDC2TOG in the 1st corner, than HDC2TOG across the next 18 stitches with last HDC2TOG in next corner stitch? When I click on the link above to your Ravelry page, it just brings me back to this page. I purchased this from the Ravelry page and I can’t find it. I sent you and email explaining it more. I need HELP! I can't afford to buy patterns. 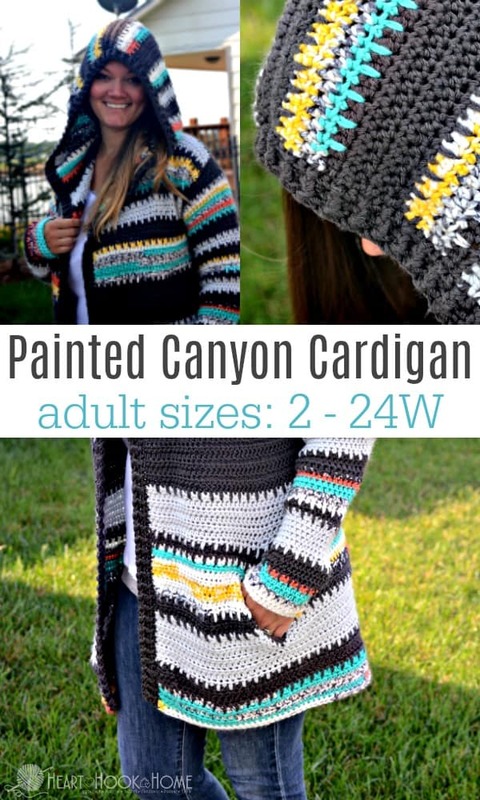 Is there anywhere I can get a free written pattern for the Painted Canyon Cardigan? It's actually very difficult in this busy life to listen news on TV, therefore I simply use internet for that reason, and take the most up-to-date news. I was curious..if you buy the pattern..is it mailed to you or emailed? (Never purchased a pattern before). Thank You in advance! Hi! It is emailed to you, and you can download and/or print it. How long does it take to email? I sent you an email too. Hi ,Ashlea Nancy here with the sleeve question, I guess what I’m trying to say is that the body looks different because we turn our work when working so it has sort of like a raised texture, but with the sleeves we go in rounds( by the way I’m doing the sleeve#2) and it doesn’t have that raised texture , the raised texture is in the inside of the sleeve . so what I’m trying to say is am I doing something wrong? Or is it suppose to look like that , and when doing the sleeve do you work with right or wrong side facing? Please help!!! Thanks! Hi Nancy! Yes you're doing it right. If you want to do back and forth in rows it would give it more of ribbed look, but it is possible that the seam would get wonky. You could do them inside out if you want the ridges. Hope that helps! 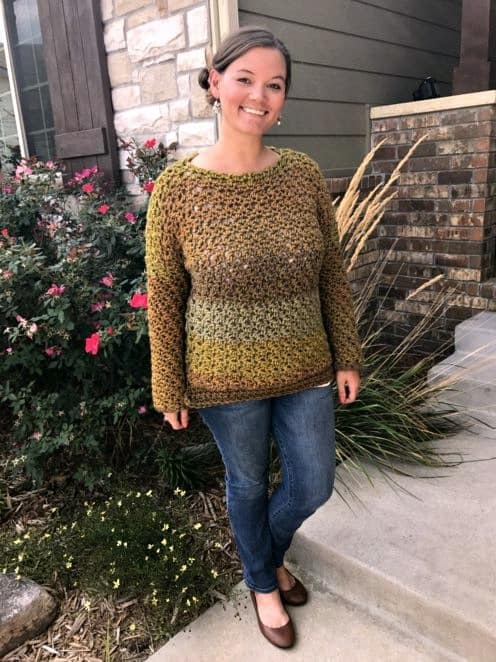 Hi Ashlea, I just purchased the pattern and have a question. I'm rather tall, 5'10 and am wondering, in the note section where you say to add rows before starting the armhole panel, does that mean instead of stopping at row 57, I continue to add rows so I will have a different # of rows when I begin the arm panels? So instead of beginning the arm hole at row 57 I may begin at row 67? and then I continue on? And the row counts will change after that as well? So instead of Row 58-80, I will have row 68-90? I hope this makes sense. Hello! It depends on if you're doing outside pockets or inside. If you do them as outside pockets, you'll just crochet in solid rows until you get to row 60 (or so) and hold it up to your torso with the top touching your underarms. If it is long enough, go ahead and start the armholes, if not, do another few rows and check again. What you describe is perfect! Can you please tell me how many skeins of each color are needed for 3x? I bought this pattern, fell in love with it. Want to make it but need to know how much per color is needed, because of dye lot, Thanks! Thanks for having this is such a variety of sizes! Its not easy finding plus sized cute patterns. I'm going on make one for my daughter and myself. Ashlea , I love this idea but I am not a hat person is there a way to make this without the hat and just have a small collar or no collar at all on it ? Thank you so much for this beautiful pattern. Im so excited to make one for myself! I do wish that you would have listed what color and how many rows of yarn you used for the cardigan you made. I love the one you made! Hi Melissa! In the pattern, under the "notes" section I state which rows and how much yarn of each. Hope that helps! Can you please tell me why the child’s 2-3 is so different from the other patterns? It has the same number of stitches for the front as the 4/5. The hood is also different. Did I miss a revised pattern for the 2/3. The front overlaps each other by several stitches. I have found this also. I just finished a 2/3 yesterday and today working on a 6month and notice a huge difference in the overlapping from the previous one. Do you have a tutorial for the inside pocket alone, I'm creating a pull over sweater for my son and would love to add them. Cheers for all of your hard work and dedication, much appreciated! I love this pattern, but I have a question about it. I don't know if I'm reading it wrong or not. I'm making one with pockets on the outside and it said to skip to row 56. Is that correct, or do you have to work the previous rows as well? I'm only asking because it seemed very short when I skipped the rows between the bottom and the armholes. Hi Nikki, I've updated that wording, if you want to redownload it from Ravelry BUT you'll continue in solid rows until you get to row 56. I am a plus size, usually a 1X or 2X. I measured my hips and decided I needed to start with 150 foundation hdc. I did that and it was in no way big enough. To get it to go around and just meet I needed 210 fhdc. I don't crochet particularly tight - I'm using I love this yarn Sand Dunes so its a worsted weight. Am I doing something wrong? Thanks for the reply about going to row 56 - I had that same question!! Hi Diane! Did you check the measurement suggestion on the pattern? I've noticed that I *really* have to loosen up my tension when I do the foundation stitches, or it bunches up the following few rows and everything turns out much bigger than anticipated. I also wonder if you need to go up a hook size, if only for the foundation row. Hope that helps! Hi Hilary, the pattern is available here: http://www.ravelry.com/patterns/library/painted-canyon-hooded-cardigan Thanks! the pattern is not a free pattern on ravelry as it appears to imply here. The child sizes are free, not the adult. I didn't advertise the adult as free on Pinterest, only the child sizes. If you find otherwise please let me know so I can remove it. Thanks! The sizes do run a bit large. I typically wear a 10-12 but I make the 6-8 version of this and it is form fitting. It really just depends on how tight you want it to be. Hope that helps! Hi Marie, Thanks for letting me know, but where do you see that it is free? 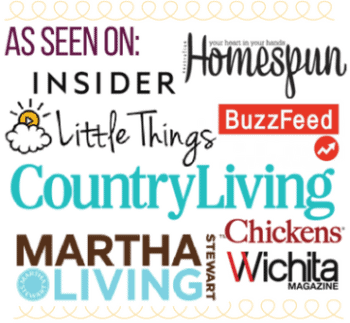 On this blog or did someone share it on a free Pinterest board etc? It shouldn't be listed as free anywhere, just the kids' sizes. Thanks! Hey! No, not for that portion. I do the spike stitches the same way though, and make sure that the top of the sleeve has the same number of stitches as the armhole has openings, if that helps? 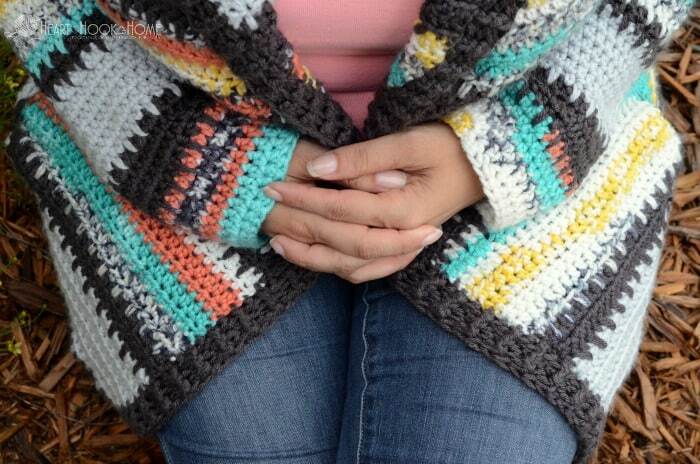 Cant wait to get my pattern and yarn..i love the colors you used. will the pattern for children sizes be an additional purchase? Yes, they are ready here: http://www.ravelry.com/patterns/library/child-size-hooded-cardigan Thank you! I'm with you on that. I'd love one that I could wear. Is there any instructions on putting the pockets on the outside like for the unicorn pattern for children? I think I like the pockets like that better. Thank you! I think, if I am correct, that the 22/24 has been completed; however I'm still waiting on the 4X. I purchased my pattern the night you presented the beautiful cardigan and it was my understanding the 4X would be out in around 3-3 weeks. I'm not real sure about that but I would like to know if I'm going to get my 4X pattern. If I continue to be sick like I have been in the last 3 months, then the 3X might work. That would be good. Hi Lynn, The 4x is ready and tested, but the 0/2 size is still not finished testing. I don't want to do too many updates so I will do them both at the same time. I can go ahead and send you the 4x part if you like separately, the sizes do run a bit on the large side also. Let me know if you want it and I'll get it send over. I have looked all over for a pattern like this.... 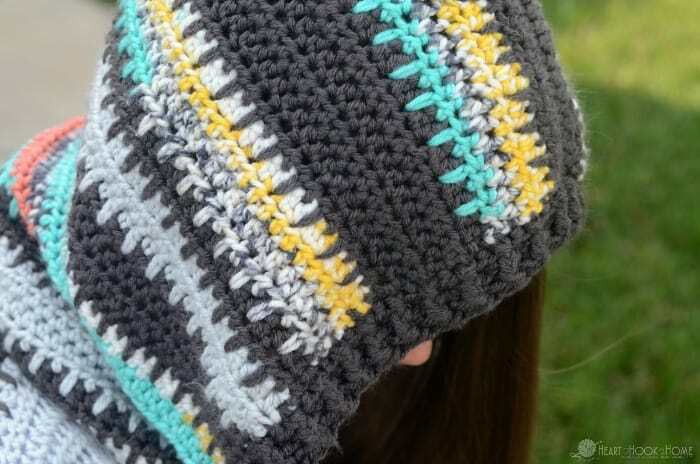 I am thinking about doing this in Mandala (light weight of 3), not doing the color changes, and not doing the extra stitch you are using on the color changes. Do you think this would work out OK? I love your colors, but I am too lazy to make all those changes! And I hate weaving in ends! LOL. Ha! Yes I think it would look great! I have done two in Mandala (I'm going to share photos along with different variation possibilities) and they turned out great! I did one with the same hook and size pattern, then I did one with a smaller hook size and a larger pattern size. Both turned out great! Hi! That one is in the works next! Hi Ashlea! I love this sweater but will need a bigger size! I saw the video and got the code for 1/2 off the pattern... do I need to wait until the larger sizes are posted or do I purchase now and get an update later? Hey Brandie! I hope you got it, when the newer sizes are added I will update the file on Ravelry and send out an update. I'm glad you love it! I didn't get a sz 14/16 in my pattern. Hi! It should be on page 11. Did you find it? Hey! You can use a DK weight yarn, just be sure to check the gauge. Since you're short, you'll want to do fewer rows between the armholes. So instead of starting the arms at row 56 (or whatever size you're making) you should probably check them at row 45 or so. If you're on gauge, every 10 rows = 4" in height. Does that help? I think Louise meant Denmark.... But glad to have your thoughts on DK. It's become my go-to weight for layering. Thank you so much for having so many new and exciting patterns! There aren't enough hours in the day to crochet all these projects you have inspired. 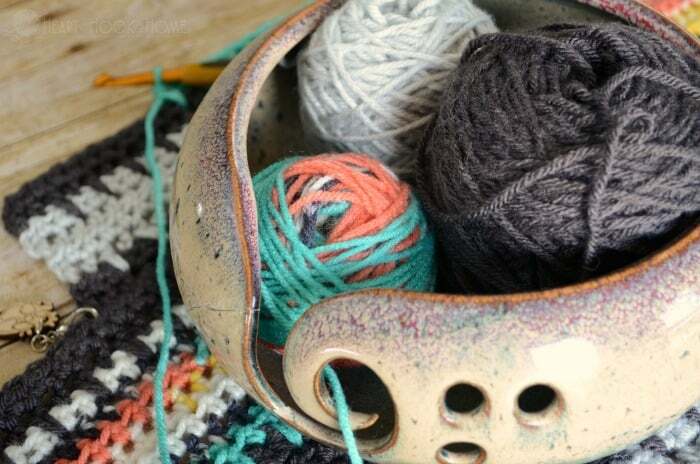 I love your yarn bowl! Where did you get it? Hi! My husband got that for me for Christmas a few years ago. He got it on Etsy, and the kids broke it shortly thereafter so I glued that sucker back together! LOL!! Likewise! The girls are quite big causing me to require a much bigger top. I'd actually need a 28-32 to accommodate them. Any chance of that? how hard is this pattern.... I am a novice and I have only made a few hats and blankets. I'm also only 5.2", so I would like to know how to adjust it donuts not so long. Thank you so much. Is this pattern easy to make in larger plus sizes?? I need like a 26/28. Unfortunately I have wide hips. We are working on a 22/24 now, and have requests for larger but haven't had a chance to try yet. I hope to though!